The Senate intelligence committee sent a letter to the founder of Wikileaks, Julian Assange, requesting that he appear to answer questions from lawmakers at a closed-door session. In the Aug. 1 letter, signed by Republican Sen. Richard Burr and Democrat Sen. Mark Warner, the lawmakers indicate that the testimony is part of the committee’s inquiry into Russian interference in the 2016 election. The WikiLeaks legal team said they are “considering the offer but testimony must conform to a high ethical standard.” The organization also pointed out that Warner was among 10 senators who demanded in June that Assange’s asylum be revoked in violation of international law. Wikileaks published emails from the Democratic National Committee (DNC) in the runup to the 2016 presidential election. The emails, which suggested that Hillary Clinton colluded with the DNC to oust then-candidate Bernie Sanders, were an embarrassment to the Clinton campaign. Assange claims to have proof that Russia was not involved in hacking the DNC and that he has information about it that has not yet been made public. Assange’s claims run contrary to the Senate intelligence committee’s findings that Russia was behind the hacking of the DNC. The committee concurred with the Intelligence Committee Assessment on July 3, concluding that Russian intelligence gained access to the DNC networks in July 2015 and maintained access until June 2016. Despite Assange’s central role in the release of the DNC emails, the Senate intelligence committee’s testimony request appears to be the first time that investigators reached out to the Wikileaks founder. “Neither Robert Mueller’s team nor the US Senate Intelligence Committee has bothered to contact WikiLeaks or me, in any manner, ever,” Assange wrote on Twitter in September last year. Neither Robert Mueller's team nor the US Senate Intelligence Committee has bothered to contact WikiLeaks or me, in any manner, ever. Special counsel Robert Mueller indicted 12 Russian intelligence officers in July accusing them of hacking the DNC. The indictment does not indicate that Mueller interviewed Assange. Assange has also hinted that there is a link between the death of Seth Rich, the director of voter expansion data for the DNC, and the publication of the DNC emails. Days after announcing a $20,000 reward for information leading to the arrest of Rich’s killer, Assange brought up Rich when discussing the risks whistleblowers take to expose corruption. When the host pressed Assange on whether Rich was the leaker, Assange said that Wikileaks does not reveal its sources. Rich died 12 days after Wikileaks released the emails. 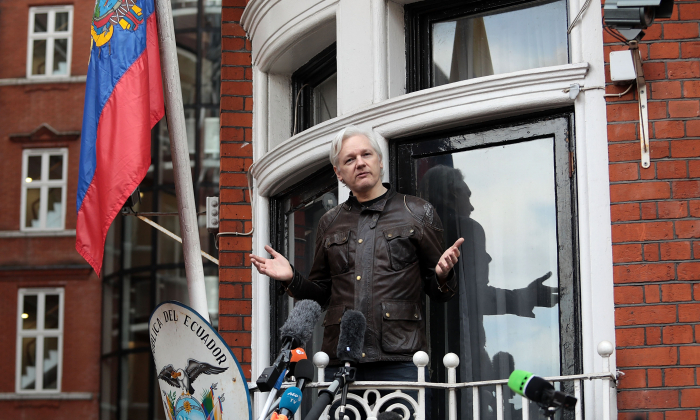 Assange has been residing as an asylee at the Ecuadorean Embassy in London for the last six years. He fled to the embassy seeking asylum as he faced possible extradition to the United States.